September 30, 2010 - On Saturday at dust 20 teams and 20 balloons consisting of two pilots (pilot and co-pilot) and a retrieve crew, from 12 countries began the 54th International Gordon Bennett 2010 gas balloon race at near Bristol, England. 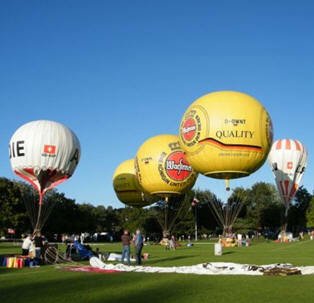 The Gordon Bennett Cup is the world's oldest and most respected gas balloon race. The Balloonist winner in the Gordon Bennett Cup will fly the furthest distance in a gas balloon on one filled tank of hydrogen. The distance is measured from point of takeoff to the point of landing. As the hydrogen in the balloon begins to deplete sand is thrown overboard to maintain altitude. The distance will be measured in a straight line around the earth's surface. The flights will be limited to the number of countries over which the balloonist may fly over or land. Entering such airspace will be a disqualifier. Pilots many not enter Italian airspace during the night this includes the island of Sardinia. Some of the pilots are expected to be in their baskets for up to five days, the race will officially end October 2nd. The record distance set for longest distance was 2,112 miles recorded in the U.S. in 2005. Balloonist will endure cold temperatures with flight attitudes as high as 10,000 feet, at grounds speeds up to 30kts and they will be changed with uncertain weather conditions. Each balloon has been provided with a GPS tracking device, which transmits the position, altitude, speed and direction of each balloon back to race control. The trackers use the Inmarsat D+ tracking service, which allows short bursts of data to be sent from the balloon to the tracking providers. On day two, the Japanese team, Saburo Ichiyoshi with co-pilot Akio Hachinohe in aerostat JA-A1044 had held a commanding lead. However, at about by 5 PM GMT the team decide decided to land rather than fly over the Pyrenees mountain range which is in southwestern Europe between France and Spain. In the Western Pyrenees, the average elevation gradually increases from the west to the east, from the Basque mountains near the Bay of Biscay of the Atlantic Ocean. In the Eastern Pyrenees, with the exception of one break at the eastern extremity of the Pyr?n?es ari?geoises, the mean elevation is remarkably uniform until a sudden decline occurs in the easternmost portion of the chain known as the Alb?res. The highest point is 11,168 ft above sea level. Japanese team official distance is 838.758km. By night fall on Sunday, with 19 balloons in-flight the French team of Sebastien Rolland with co-pilot Vincent Leys in aerostat F-PPSE took the lead having crossed crossed the Pyrenees. 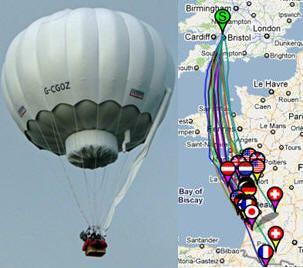 There are a number of balloons off the French coast west of Bordeaux traveling at ground speeds between 10-15kts. Just before midnight Finland's Olli Luoma with co-pilot Markku Sipinen in aerostat OH-OCO landed in a large corn field after a 23 hour flight. Their distance is over 800 KMS. On Monday around 10 AM GMT the American team landed around Manlleu which is a is a town in the comarca of Osona, in the province of Barcelona, Catalonia, northern Spain. The Austrian team landed about 1 PM GMT, Gerald St?rzlinger with co-pilot Nikolaus Binder in aerostat D-ORZL landed in France after a flight of approx 38 hours and a distance of almost 1000km. By 2 PM GMT 10 balloons had landed, 8 still flying and maybe 2 landed and yet to report in. On Wednesday, around 8 AM the Italian coast guard received a call from the U.S. team, Richard Abruzzo with co-pilot Carol Rymer Davis in aerostat N-801NM. The balloonist reported to the coast guard that they were having problems. The coast guard then lost radio contact. The U.S. team is reported to be missing over the Adriatic Sea, between Italy and Croatia. The Italian ATC and coast guard have been informed. Weather conditions in the area are poor with thunderstorms and rough seas. Search operations by the Italian Maritime Rescue Coordination Centre continue. As of midnight local time there were three balloons in the air. On Thursday, as of 8 AM local time the balloon flying in the Gordon Bennett race designated USA2, registration N801NM is still missing. The pilots are American citizens, Richard Abruzzo and Carol Rymer-Davis.At 05.58Z Gordon Bennett Control Centre 29th September) received the last signal from the tracker device, which normally gives us the balloon position every 15 minutes. At that time they were contacted by Brindisi Air Traffic Control who had lost contact with the balloon. Mr. Luc Trullemans, meteorologist, had a conversation with one of the pilots at 06.05Z. No contact has been established since. The balloon is equipped with satellite telephone, VHF radios, radar transponder and two mobile telephones. It has not been possible to make contact on any of these. Thunderstorms were present in the area. A search and rescue operation continue to search for the missing Americans. Italian Maritime Rescue Coordination Centre (MRCC) are using several aircraft and a fast patrol boat in their search efforts. The Croatian authorities and all shipping in the area have also been notified. It was first run on September 30, 1906 in Paris, France. The event was sponsored by James Gordon Bennett, Jr., the millionaire sportsman and owner of the New York Herald newspaper. Inaugurated at a time when powered air flight was in its infancy, Bennett wanted to encourage the technical development in this field and in 1906 created a special competition open to powered flying machines. The winner of the first ballooning event was American, Frank Purdy Lahm who, along with his balloon co-pilot Henry Hersey flew just over 400 miles to the northeast coast of England. In 1907, St. Louis, Missouri was host to the first ever Gordon Bennett Cup race to be held in the United States. In 1908, the Swiss winners set a world duration record of 73 hours aloft, a standard that would not be broken until 1995. In 1910, the winning balloon flew 1,887 kilometres from St. Louis, to northern Quebec in Canada. It took the two pilots, Alan Ramsay Hawley and Augustus Post, a week to walk back to civilization. After being interrupted by World War I, the race was held every year until the outbreak of the Second World War. It was not revived until 1983 when the International Aeronautical Federation reinstated the popular race with the winning country usually hosting the following year's competition. On September 12, 1995, three gas balloons participating in the race entered Belarusian air space. Despite the fact that race organizers informed the Belarusian Government about the race in May and that flight plans had been filed, the Belarusian air force shot down one balloon, killing two American citizens. Among the other two balloons, one was forced to land while the third balloon landed safely (because of deteriorating weather) over two hours after the downing. The crews of the two balloons were fined for entering Belarus without a visa and released. Belarus to date has not apologized or offered compensation for these killings.